Hilton HHonors members urged to have "balanced perspective on devaluation"
Jeff Diskin, senior vice president of global customer marketing who heads up the Hilton Honors programme, has defended the new redemption categories for Hilton HHonors which come into effect on January 15 2010. The changes which are detailed on the Hilton HHonors site here involve a devaluation of points redemption. The most notable shift is in pushing most if not all hotels into a higher redemption category. The effect of this is that a hotel such as the Hilton London Green Park which is currently a category 6 hotel and so would “cost” a Hilton Honors member 40,000 points for a one night redemption will, from January 15 2010 when the changes come into effect, become a category 7 hotel, and cost some 50,000, a 25 per cent increase in points required. The changes have been widely criticised, not least on the businesstraveller.com forum, but defending the changes, Diskin asked for a “balanced perspective” from the 8.5 million active members who represent more than 40 per cent of the occupied room nights in the Hilton family of brands hotels. Here are the relevant tables and FAQs covering the changes. Diskin also said that the Hilton HHonors programme had several key advantages for travellers, including popular brands, over 3500 properties, and a programme which does not differentiate between the brands (so a dollar spent in one property earns the same amount of points as a dollar spent in a five-star Conrad or Waldorf Hilton property). Diskin said the programme had also recently launched a new iPhone mobile application “…that lets our gold and diamond members not just check in 48 hours in advance into Hilton Doubletree or Embassy Suites but also do a pre-arrival wish list including food and pillow choices. Finally Diskin said that the hotel owners who have Hilton franchises have seen no downturn as a result of the prospective changes. 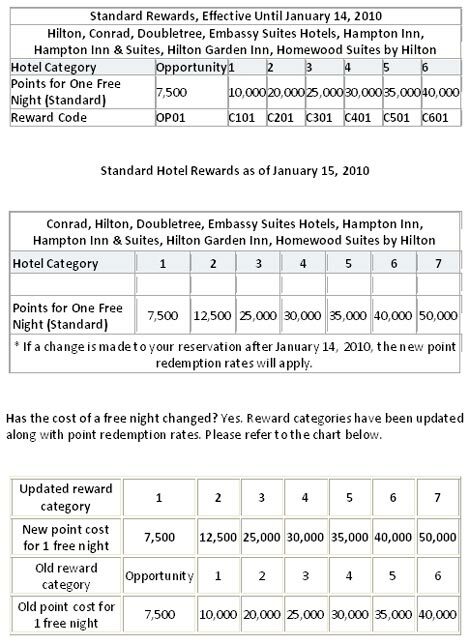 Current and forthcoming redemption tables provided by Hilton.